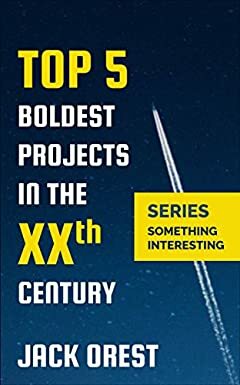 The book describes the boldest 5 projects of the mankind in the XXth century. The author explains the selection of the first four projects from the perspective of the influence on human possibilities, and the last one due to the availability of the myths. There were covered the following spheres of human activity: space, nuclear weapon, computers, excavation and drilling. The set forth information has been supplemented with the interesting facts about the flights of space vehicles to the distant planets, about the legends of the Kola Superdeep Borehole, surprising parameters of Tsar bomb explosion etc. The book will be interesting for a wide range of readers: from the youngest to the eldest, all who are interested in history, geography, adventuresâ€¦ We recommend the book also for those who want to read something interesting.